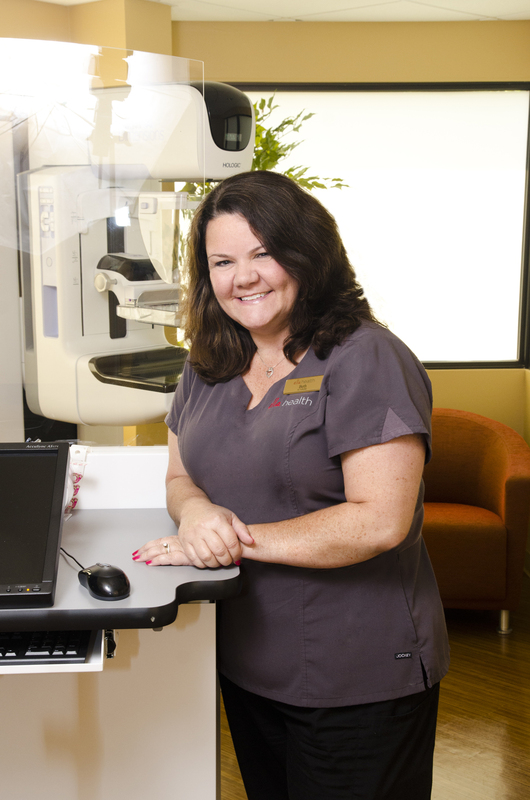 Mammographer Beth Quinn is unfazed when a woman comes in scared to get a breast cancer screening exam. The experienced tech has seen it many times and she knows exactly what to do. She starts by taking the time to listen to the patient and hear her concerns. Then she takes time to carefully explain what will happen during the exam. The most important part, however, is making sure that women know they are in control. “I explain about what will happen during the exam. I tell them about the compression and that they will feel a squeeze for just a few seconds before the machine automatically releases. And I let them know that if at any point they are feeling discomfort or pain, we will stop,” Beth said. Understanding that they have control really make a difference for patients. They seem to relax more and the exam goes more smoothly. Working with these women and helping them conquer their fear is the best part about her job, said Beth, who is the center manager at Ella Health in Pike Creek. Beth got into health care in part because of watching her father struggle with disabilities and medical issues related to a severe injury he sustained in the Korean War. She went into imaging expecting to be looking at broken bones but started in mammography early on. When she first started, mammograms were on film. Often, additional images were needed to get an accurate picture of the breast. This changes with the introduction of digital mammograms. With this new technology, only two images were needed in most cases. The most recent advance, 3D mammography, provides an even clearer and more comprehensive image. The system takes multiple pictures during the exam. It makes it easier to detect cancer and rule out areas that are not cancer. “This means it is less likely that a woman will have to be called back for more imaging that turns out to be nothing. This new technology really offers peace of mind to our patients and that means a lot to me,” Beth said. Beth said it’s important to her to get the word out about how much mammograms have changed and that the exam can be a comfortable experience.